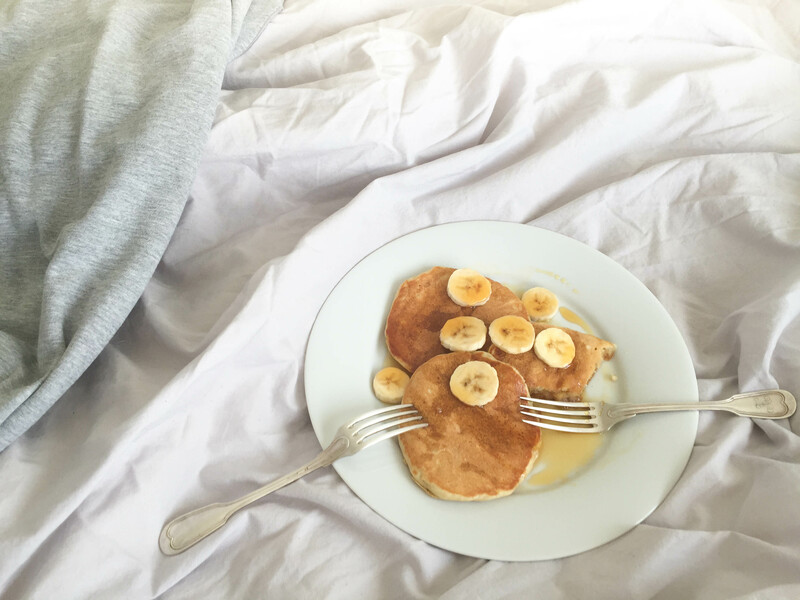 Monday mornings are not exactly my favorite, but a good breakfast in bed can make any day better. Pancakes can be an amazing all-time favorite breakfast treat, but they can also be a syrup-drenched soggy disaster. You want your pancakes to be fluffy and spongy, but they also need to hold their own when you smother them in warm maple syrup. The basic recipe for these beauties fulfills both requirements. If you are not feeling particularly banana-y, simply leave out the bananas (or substitute other fruit) and the spices. Today, I felt like something just a tiny bit more extravagant than regular buttermilk pancakes. The resulting flavor is reminiscent of classic banana bread and is slowly getting me excited about Christmassy spices. When you want to create something with an intense, sweet banana flavor, you need very ripe bananas. 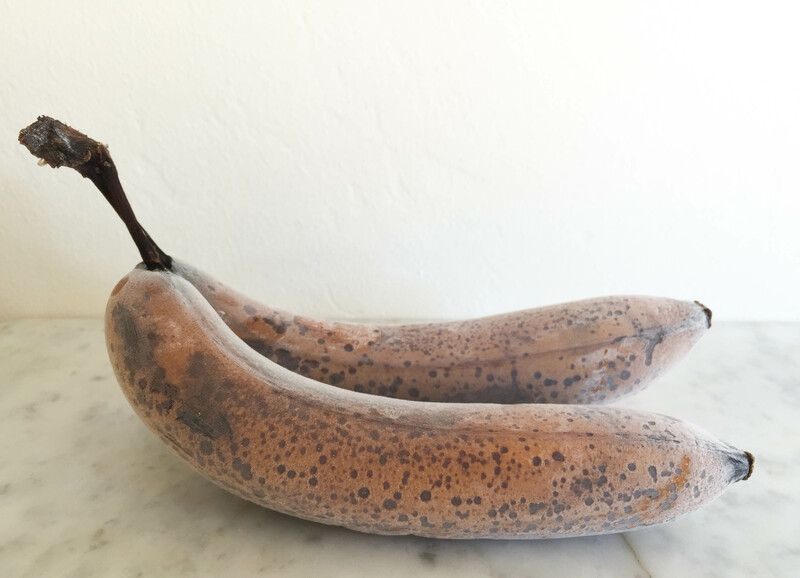 Unfortunately, most bananas you find at the grocery store are far from perfectly ripe. Even if the peel already looks nice and yellow, they are usually still very starchy, not quite sweet yet, and feel almost slimy to the touch when you cut them. There is a sweet spot for banana bread and the like, when bananas are a rich, dark yellow with brown speckles all over, and have just passed the point at which you don’t really want to eat them plain anymore. Sadly, this stage of intoxicating banana aroma perfection does not last very long. What can you do? Buy unripe bananas and wait for that magical day when they have reached their full ripeness? I don’t know about you, but I usually like to be a bit more spontaneous with my meal planning. The solution is simple. Once your bananas are perfectly ripe, throw them in the freezer, peel and all. They will last a couple of months and thaw really quickly, so you can start baking with them whenever you want. Just give them about 10 minutes to thaw (they will get very soft, though, so this technique works best if you are going to puree them). One of my biggest problems with pancakes and waffles is that I usually end up with a huge pile of leftovers, so I have adapted this recipe to comfortably feed two people. If you have a larger crowd, simply double or triple the amounts. This batch made 8 pancakes with a diameter of about 4 inches. Melt the butter in a small pot or bowl, set aside to cool. Mash the very ripe banana with a fork (I like leaving a couple of larger junks in there). Mix the flour, salt, baking powder, and baking soda in a large bowl. Beat the egg and vanilla sugar until frothy. Add the buttermilk and cooled butter. Stir until well combined. Preheat your non-stick pan or griddle. Dip your fingers in some water and spritz it onto the hot pan. If it sizzles and evaporates immediately, the pan is hot enough. Dip a paper towel in the canola oil and very quickly wipe the surface of the pan with the oiled paper towel. Be careful not to burn yourself! 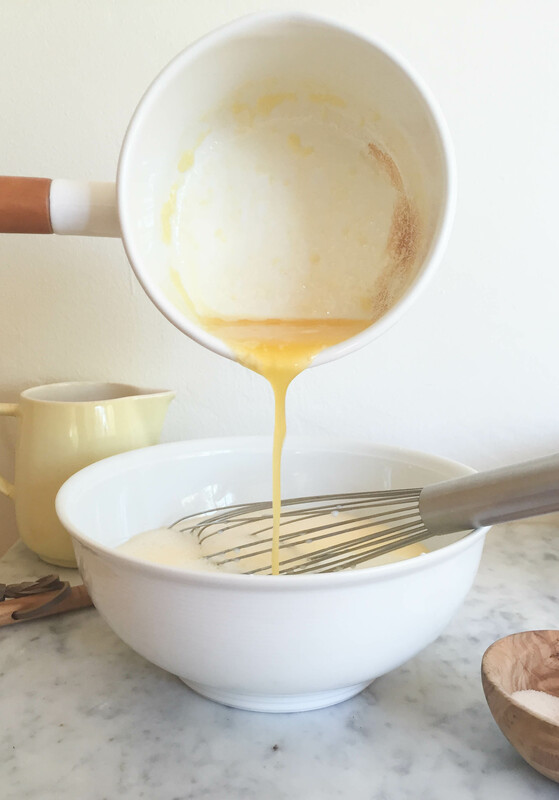 Add the buttermilk mixture to the dry ingredients and gently stir until it combined (I use a wood spoon instead of the whisk to make sure I don’t accidentally overmix the batter). Make sure to leave small to medium lumps of flour. Don’t worry, your pancakes will not have small pockets of dry flour in them, I promise. Gently fold in the banana puree and spices. Add about 1/3 cup of batter to the pan. There is a French saying that the first crêpe is for the dog, so don’t fret if it doesn’t come out quite right. My first pancake is always hideous. It takes me a little while to adjust the temperature and figure out the time it takes to cook each pancake. Cook on medium heat for about 3 minutes on the first side, carefully flip them, and continue to cook for about 2 minutes. 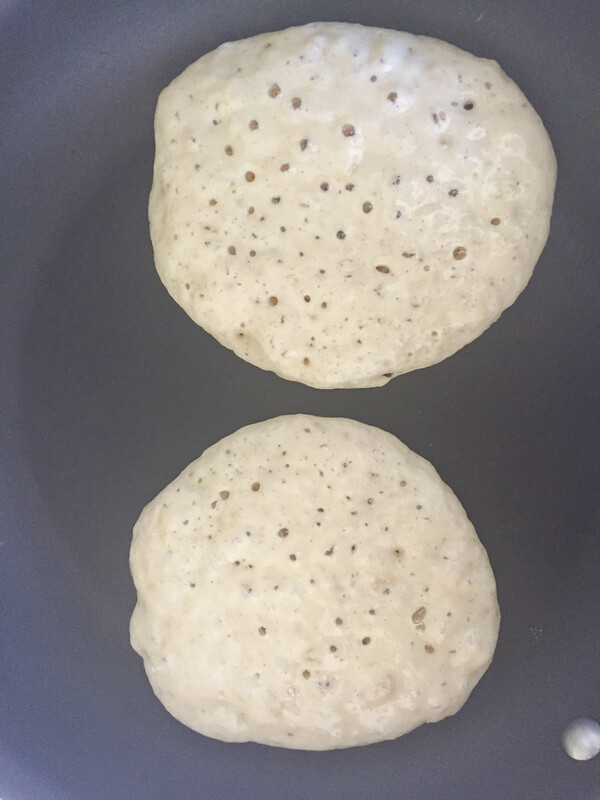 The pancakes are ready to flip when the bubbles toward the outer edge are starting to set. You can also carefully take a peek to check whether the bottom is golden brown. If you find that they are sticking to the pan too much, simply give the pan another quick wipe-down with the oily paper towel between batches. 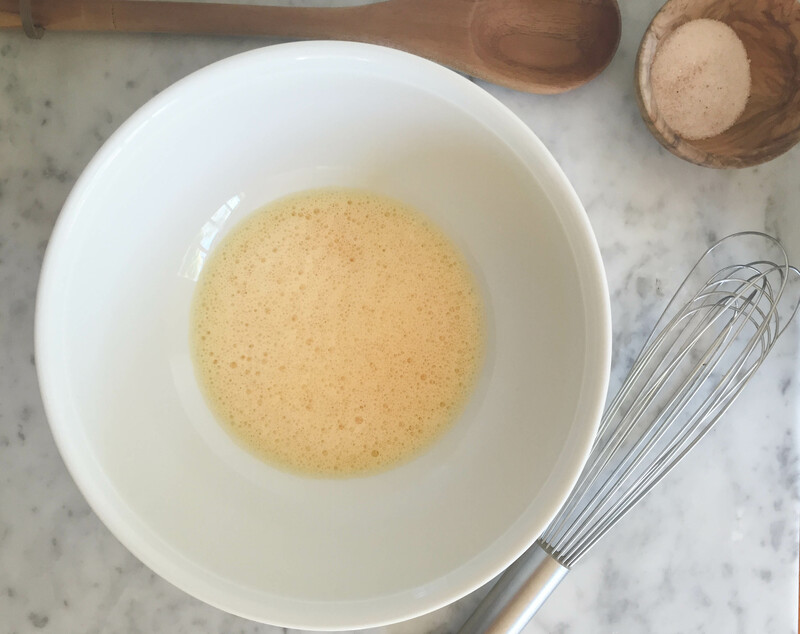 Pour the maple syrup into a bowl and warm it up in a water bath or in the microwave (this is optional, but I really like it – pancakes cool down quite quickly, and you don’t want to speed up the process even more by pouring cold maple syrup over them). Cut the fresh banana into slices. 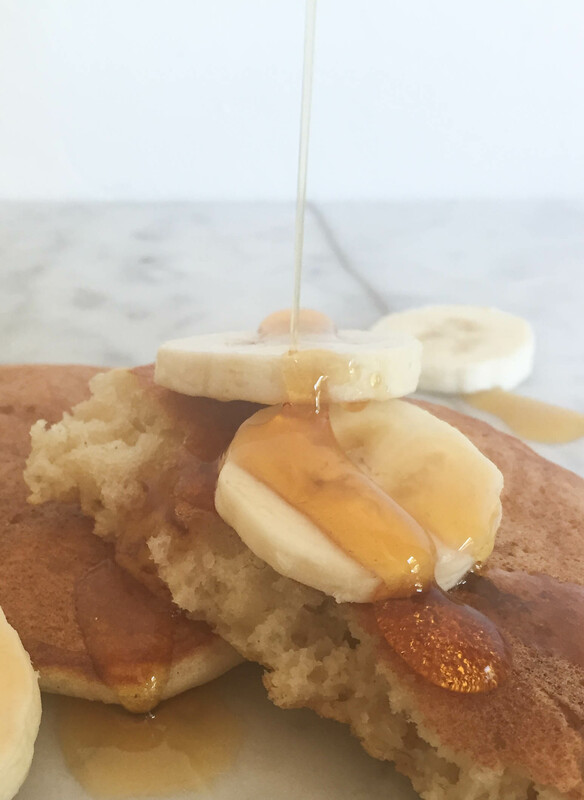 Plate the pancakes and banana slices, and drizzle with syrup. Remember, these pancakes are meant to be eaten with syrup, so they are not very sweet by themselves. 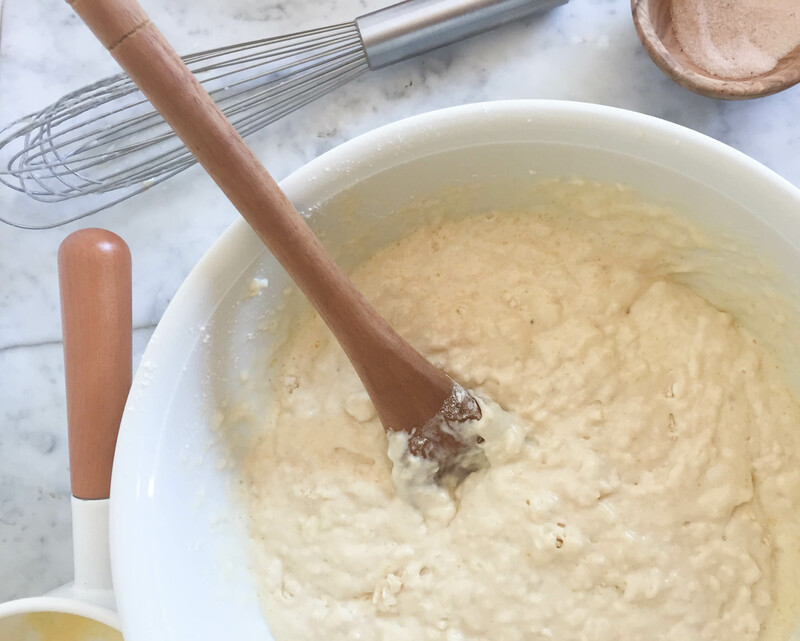 If you don’t want to add syrup, honey, jam, or the like, you might want to add a little bit more sugar to the batter. Tip: Once you have found your perfect mix, why not prepare mason jars with the dry ingredients for the next time? Simply measure the amounts of flour, sugar, salt, baking powder, baking soda, and spices for one batch, and fill them in a dry (!!!) jar with an airtight lid. If you prepare several of these batches at once, it will save you quite a bit of time next time around. If you add a little label listing the missing wet ingredients and instructions, it also makes a cute gift. Update: If you end up with leftovers, let the pancakes cool down completely and place them in plastic freezer bags (I put about three pancakes each in a ziploc freezer bag, so they are already portioned). Remove as much of the air as possible from the bags before you place them in the freezer. When you want a quick and easy breakfast, simply remove the desired number of pancakes from the bag, and cook them in the toaster on a low setting. They will be slightly crispy on the outside and not quite as good as when you make them fresh, but a million times tastier than store-bought frozen waffles. 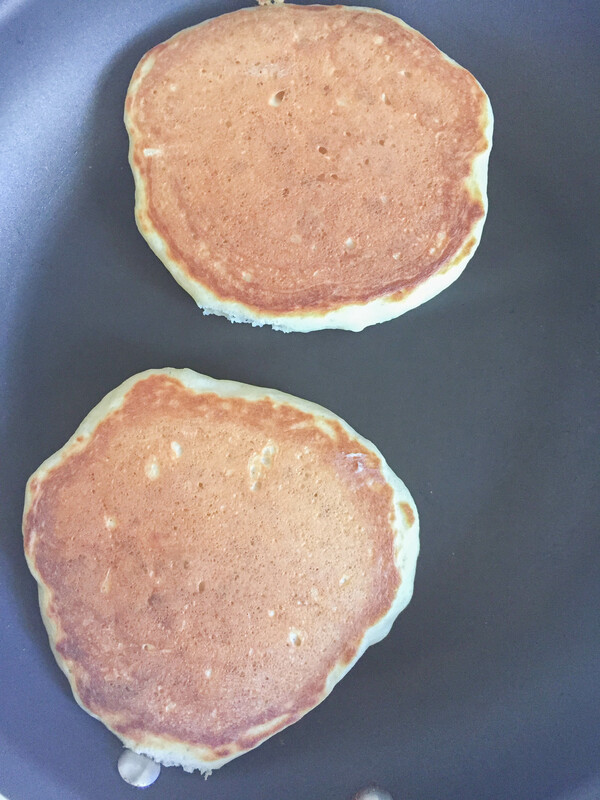 …and yes, I was dancing through the kitchen, singing Banana Pancakes. 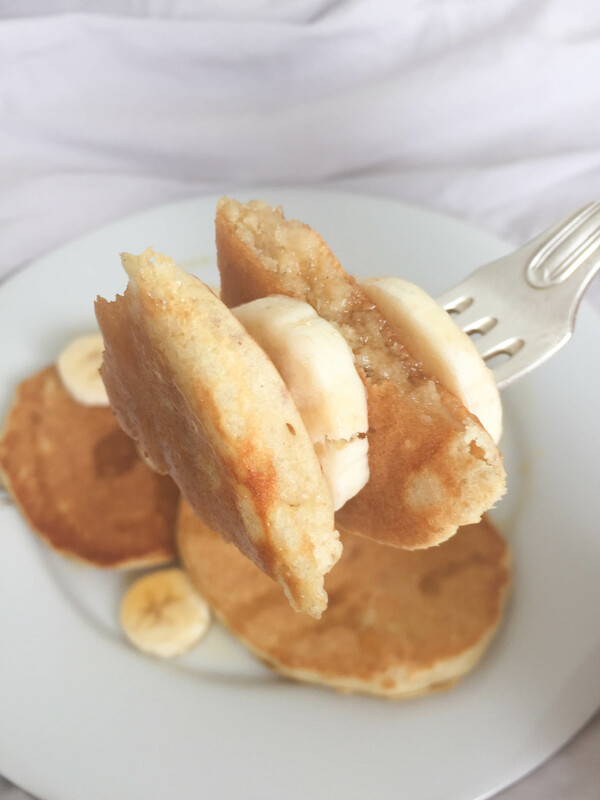 This recipe reminds me of the banana pancakes my mum would make. Always so much more delicious than the regular kind! Thanks, Bunny. Yes, these are total comfort food!